This is especially for all of you that love and care for your pets. Whether it’s a dog or a cat, pets can be counted on to love unconditionally, however after a period of time you will see your new carpeting taking on a brownish tinge. Even your hardwood, cats and dogs have claws that can easily scratch that shiny finish. Sure you can refinish a hardwood floor, but how often are you willing to do that? As we all know, our pets are a constant source of surprise, or they’ll grow bigger than you expect, they’ll end up weighing 15 pounds instead of 9, with claws that can dig to the other side of the world in fifteen minutes. Be sure to read the warranty so that you always know the exact limitations. • The Surface Wear Layer (the part you see) is made of a tough aluminum-oxide. It can look like hardwood, tile, stone, or brick. This layer is actually a photograph of a real floor, which repeats to look exactly like any floor pattern you desire. • The Core is made up of a variety of materials, mostly high density fiberboard (HDF) which is a durable engineered wood product, made to resist moisture. • The Backing ranges from a paper layer to a full plastic laminate layer. Laminate with plastic backing is obviously more so moisture resistant. In addition to health considerations, laminate flooring cannot be refinished. It's also pricey, so if it is scratched or stained, you will have no choice, except to replace it. Consider buying an extended warranty policy, which covers replacement, should your floor hold a stain. Buying cheaper, to save money, should not be an option. It's worth the expense to know you can depend on your laminate flooring. For many people hardwood floors are the only option. 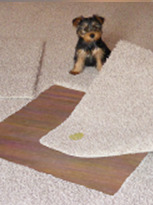 If that is true for you, you can still insure that your floors are pet friendly. Here are a few tips to keep your floor in shape and you and your pet happy. This way you can enjoy your pets no matter what floor you want! They are with us for such a short time, and they make our lives that much richer for the time that we are allowed. Don't let worries over flooring steal that joy. After all, how much is it worth to have a perfect, unconditional love?